On September 12th Claudia Hinz observed the sunset from the 1835m high Wendelstein Observatory. At 19.18 CET (Daylight saving) the sun disappeared behind a 250 km distant thunder cloud over the Black Forest, Schwarzwald, in South Eastern Germany. Then the sun would have been ~2° above the astronomical horizon. The sea level horizon was 197 km distant and dipped 1.4°. At around 20.00 sheet lightning was noticed on the horizon. At 20.15 a 30° long crepuscular ray was formed by the thundercloud. At that time, nearly an hour after sunset, the sun was 8° below the astronomical horizon. 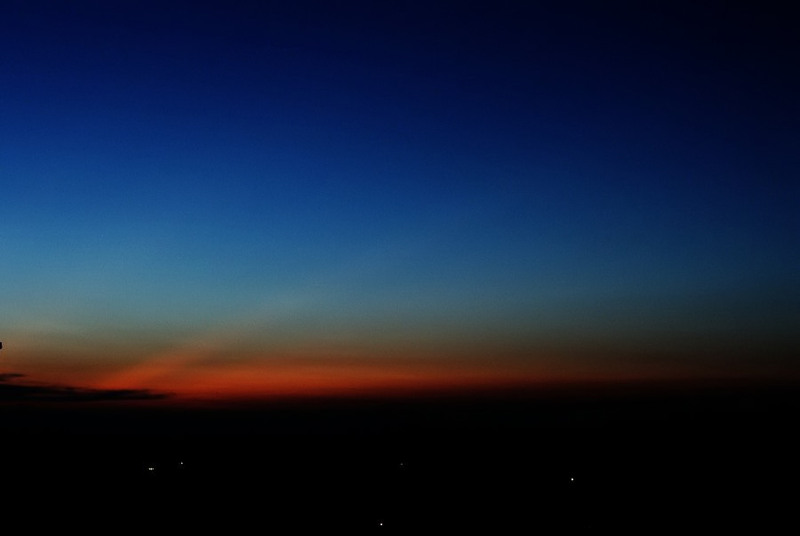 The ray was faint but clearly seen over the remaining twilight colours. The image was made with a 150mm lens and a 4s exposure. Posted on May 14, 2011, in observations, shadows and rays, twilight phenomena and tagged crepuscular rays, Mt. Wendelstein, rays, twilight. Bookmark the permalink. Leave a comment.